Have you perhaps noticed a few scrapings and flutters coming from your rooftops in recent months? Due to an extremely mild winter, many birds have already started nesting and others are seeking out a safe place to bring up their families. 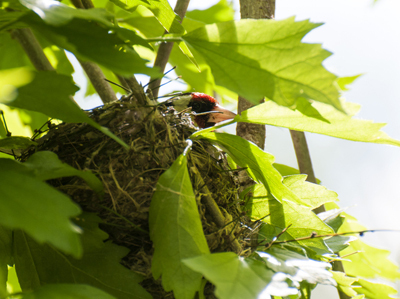 The RSPB is urging people to be aware and mindful of nesting birds and to avoid disturbing any area of their house they believe to be inhabited. ‘Birds are naturally secretive and tend to build their nests in hidden places for safety,’ says Richard James, wildlife advisor at RSPB. Birds will also seek out some of the less obvious shelters for their nesting. Anthony Straight, a mechanic from Romford, discovered a pair of Robins had built a nest in his motorbike earlier this month. ‘The bike started smoking and smouldering and I was worried that it meant an expensive bit of work. But on closer inspection, I found a bird’s nest with three eggs inside,’ he said. ‘The RSPB advised me to leave the bike alone and the young are now hatched and growing nicely.